[0:00] <unpopsicle> 22:54 <unpopsicle> your oss project requires 4gb of ram? [0:05] <local> anyone in here had experience with the USB drive called "PNY Wave 128GB" on a RPi ? (http://www.amazon.com/s/ref=nb_sb_noss?url=search-alias%3Daps&field-keywords=pny%20wave%20128gb) ??? [0:14] <local> shiftplusone: I am just looking for a USB drive >128GB and that was the cheapest one in my country. I have red one comment, that read and write throughput is also pretty good although I dont care anymore about it, after I have learned that the usb bus is shared with the NIC and I dont expect high throughput. [0:15] <shiftplusone> local, why not use a powered HDD? [0:15] <Firehopper> http://www.flickr.com/photos/firehopper/9710747741/ < nearly finished! [0:16] <shiftplusone> Firehopper, is that a harley? [0:17] <local> shiftplusone: what whould be the advantage? [0:18] <shiftplusone> local, much cheaper and reliable, that's all. [0:19] <local> shiftplusone: you mean a normal USB drive in 2,5" as an example? Won't I need an extra USB hub for that constellation? [0:19] <shiftplusone> Firehopper, silliness aside, nice. [0:20] <Firehopper> and something else.. UDOO's may be shipping soon! [0:20] <shiftplusone> local, not if it's already powered. (has it's own power port sort of deal). [0:21] <shiftplusone> local, fair enough. [0:21] <plugwash> I suspect there is a niche out there somewhere for a board with both lots of processing power and easy interfacing. [0:22] <Firehopper> http://www.kickstarter.com/projects/435742530/udoo-android-linux-arduino-in-a-tiny-single-board/posts < udoo boards! [5:25] <Sonny_Jim> What's the problem? [5:35] <AHemlocksLie> I set it up from the Retro Pie setup script, and I left SNESDev set to start at boot. [5:37] <Sonny_Jim> Don't you just hold down one of the buttons on player 1? [5:38] <AHemlocksLie> Do I have to use SNESDev with it? [5:48] <Sonny_Jim> Maybe the kernel got updated when you rebooted? [5:50] <Sonny_Jim> Isn't there a distro purely for RetroPie? [5:51] <AHemlocksLie> Which ones? For wiring SNES controllers? [6:01] <Sonny_Jim> Has anyone actually played cave story for longer than 5 minutes? [6:01] <Jeebiss> can someone explain why when i type 'lsusb' it shows 4 devices, when I only have 2 plugged in? [6:02] <PhotoJim> it'll show root hubs. [6:03] <PhotoJim> if you see "root hub" that's the root controller for your USB system. just ignore it. [6:04] <AHemlocksLie> How can I set up a way to exit ROMs without keyboard, though? [6:05] <AHemlocksLie> I hear it doesn't actually write any of your saves until you press ESC to exit anyway, and since I'm only using an SNES controller, I've kind of got them all mapped out already. Can I map it to a combination of buttons on the controller? [6:08] <PhotoJim> oh, on the Pi you have other devices that appear to be USB like your Ethernet. [6:08] <PhotoJim> they are USB, but they're on the board logically wired to a USB "port" that can't be used for anything else. [6:17] <AHemlocksLie> I found that I can set up an emulator exit button by adding "input_exit_emulator_btn = "6"" (to map button 6, for example) to my RetroArch config. Can I make this a button combo instead of a single button? [6:23] <Jeebiss> is there a way to see if the microphone on this webcam is registering on my pi? [6:28] <Jeebiss> i assume my cam? [6:38] <Jeebiss> Sonny_Jim: is there anyway to get a visualization of it capturing sound? [6:51] <Jeebiss> Sonny_Jim: are you familat with arecord? [6:53] <Jeebiss> "arecord: main:682: audio open error: No such file or directory"
[7:04] <blob> anyone build an ARM cross toolchain from source ? [7:09] <Jeebiss> now im getting "Channel count non available"
[7:11] <Sonny_Jim> When doing what? [7:13] <Sonny_Jim> If you receive a cryptic error message about "Channels count non available" then the wav file uses a sample rate different to the hardware. You can add a resampling layer with the 'plug' plugin, e.g. [7:25] <AHemlocksLie> For Retro Pie's Duke Nukem 3D stuff, what files do I need? [7:28] <Jeebiss> oh, i can just use sftp? [7:44] <Geoffles> balls, okay, never mind. anyways, i'm attempting to connect a 32 pin FFC to one of the Raspberry pi connectors. any idea as to how i would achieve that? [7:48] <monkeykong> i suppose so. [7:48] <Sonny_Jim> got a pic? [7:49] <Sonny_Jim> What do you plan on doing with it? 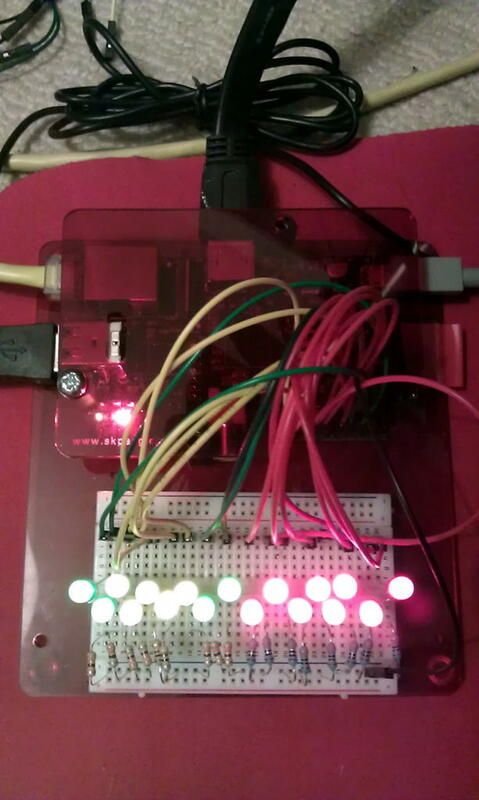 [7:50] <Sonny_Jim> How do I hook up an LCD panel to the GPIO pins? [7:50] <monkeykong> would you happen to know how to do that? [7:54] <Jeebiss> Anything seem obviously wrong? [7:56] <Jeebiss> is that better? [7:57] <Sonny_Jim> Your paste has triggered our automatic SPAM detection filter. [7:57] <Sonny_Jim> (slang for "Lets have a look"
[8:00] <Sonny_Jim> What's the actual error? [8:00] <Jeebiss> It doesnt give one, it just starts the program, and tries to do a websearch for "plughw:1,0"
[8:01] <Sonny_Jim> What command line are you giving it? [8:01] <Jeebiss> What do you mean? [10:35] <bts__> what's the difference between auxiliary SPI1, SPI2 devices and SPI, both described in separate chapters of BCM manual? [10:45] <bts__> oh, now I know the difference. Auxiliary SPIs just do not exist. [11:34] <Th0rsten> Hello. I downloaded raspbian and wanted to start my rpi (for the first time). despite editing the hdmi related lines in config I don't get any signal on my monitor. Any suggestions? [12:00] <hexabit> Jck_True: You like the name? [12:01] <hexabit> Rydekull: hehehe "Termites"
[12:01] <hexabit> Jck_True: Yeah Lotus i think? [12:11] <[Saint]> to me gnu<foo> just means its expected to carry a permissive (gpl) license. [12:12] <[Saint]> free as in freedom, etc. [12:13] <[Saint]> Well, its not really hard to do that. [12:14] <[Saint]> supply source when prompted with a shipped binary is the only real requirement. [12:15] <[Saint]> hexabit: if it isn't already, you might want to consider licensing it under one of the GNU licenses. [12:18] <tig|> Gadgetoid: what toys have you ordered? [12:18] <tig|> more stuff from phenoptix? [12:26] <[Saint]> Man, it is suddenly *very* windy here. [12:27] <[Saint]> The council is working on the road outside, and there's heaps of dust and sand being blown around in large clouds, it looks and sounds awesome. [12:27] <Gadgetoid> [Saint]: dust and sand? Are they mining for Spice? [12:29] <[Saint]> They're resurfacing the road, footpaths, and gutters, and repairing a massive storm water drainage system pipe that runs right up the center of my street. [12:30] <[Saint]> It was severely damaged during the Christchurch earthquakes ~4 years ago. [12:30] <[Saint]> it wouldn't be hard to make one. [12:32] <Rewt`> little nagging project I have obsessed on in my silly brain seems to require it. [12:33] <[Saint]> I ordered one of those cute little pihub things just before. [12:34] <[Saint]> They're *so* cute. [12:34] <[Saint]> ...little 3A hub, shaped like a raspberry. [12:35] <dunfy> Hi guys, I recently purchased a faulty raspberry pi and was wanting to try and diagnose what's at fault. [12:37] <dunfy> Just a solid red light with a faint green ACT, which means from what I've read it hasn't read the bootcode from the SD yet. [12:39] <dunfy> no yeah that's cool, I've tried the power and sd card in another pi, which works. [12:40] <steve_rox> check sd card reader has no damage? [12:40] <dunfy> Yeah I know, I purchased it knowing it was faulty, I was kinda hoping the person selling it wasn't using it properly. But now it's just a testing game to find out if it's a burnt out chip or something minor. [12:40] <dunfy> I've checked all the SD chip connectors with a multimeter and all seem intact. [12:41] <steve_rox> does the card detect pins short over? [12:42] <dunfy> You mean going through each sd reader pin and seeing if any of them are shorted? [12:44] <dunfy> Fair enough, no point in returning, as mentioned above I purchased it knowing it was faulty. [12:46] <dunfy> Yeah I guess that's the last option, I'm starting to wonder if the chip has burnt out, any way of telling ? [12:47] <steve_rox> re cook it? [12:48] <dunfy> Not overly bothered about parts, was a last minute ebay auction, you win some you lose some. [12:49] <steve_rox> how much you pay for the dead rpi? [13:51] <xz81> it would be perfect if I could use it as podcast player. Anyone using raspi this way? [15:50] <alanhoff> Does RP have some unique identificator that I can grap inside the OS? [15:51] <tig|> alanhoff: per pi? [16:07] <alanhoff> tig|, Jusii, awesome! thx! [16:31] <armin> hi, shouldn't writing the .img raspbian image to mmcblk0 with dd be sufficient to end up with a bootable sd card? [17:46] <sover> Can anyone help me with that? [17:55] <RavenII> Like you need help picking it up and physically rotating it? [19:08] <troulouliou_dev> ajf, what is your max spec ? [20:01] <RavenII> haha. I need that. [21:24] <IT_Sean> why is "port" in quotes? [21:24] <shiftplusone> all the work is already done, he just needs to adjust it a bit to include the pi-specific things to the egl init code. [21:33] <plugwash> What is DISPMANX_TRANSFORM_T ? [21:33] <plugwash> is it an enum? [23:20] <pksato> directly = without resistor? [23:33] <plugwash> so we can only guess as to what is "safe"
[23:37] <vamo> Hi. Does anyone have experience splitting the memory of raspberry pi and can help me? [23:37] <gordonDrogon> we have enough specs to use it effectively. [23:38] <gordonDrogon> LEDs are perfectly fine with limiting resistors. [23:39] <gordonDrogon> chris_99, the max. current a pin is capable of sinking or sourcing is not well defined - as "nornally" it doesn't need to be when you're connecting up logic devices. [23:40] <gordonDrogon> so the default is 8mA, but you can increase the drive strength to 16mA. [23:47] <vamo> willybilly0101: /boot/config.txt ? [23:48] <vamo> I know, it's just not doing anything except getting the pi to hang. [23:51] <XVampireX> Has anyone figured making a media player out of the RaspberryPi ?